Rob Maniscalco has been active in the Charleston Theatre community since 2007, with Footlight Players performances in The Full Monty, Sordid Lives, Rumors, Frost/Nixon and Is He Dead. He also has appeared in the College of Charleston’s Shakespeare Project’s Measure for Measure. Rob played a Chicago Mob boss in PURE’s production of Superior Donuts. 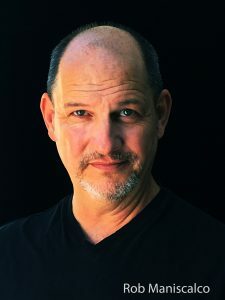 He received critical acclaim as John Hale in Threshold’s production of The Crucible and Beethoven in 33 Variations at Threshold Theatre. He returned to Footlight with his portrayal of George Bailey in a musical version of “It’s a Wonderful Life” called Miracle in Bedford Falls. Most recently, Rob portrayed Vincent van Gogh in a play he wrote about the master called, Vincent John Doe, performed at Piccolo Spoleto in 2018. You are invited to the 2019 PS production of VJD, June 6-9. He received his acting training at the Circle in the Square Theater in New York City. In 1993 he made his Carnegie Hall debut with the New Renaissance Chamber Artists, an experimental ensemble of musicians and actors. He has a B.M. in orchestral performance. In Detroit, his home town, Rob was host of “Art Beat,” a highly rated TV show on PBS, where he interviewed celebrated artists in their studios. He also did a lot of great theatre in Detroit’s top venues. As Rob’s “day job,” he is a nationally recognized artist; his fine art and portraits are part of hundreds of private and public collections throughout North America, including many prominent Charlestonians. He was the courtroom sketch artist for the Dylann Roof trial. Check out maniscalcogallery.com.